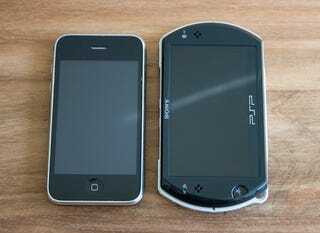 The Same Game Costs More on PSP Mini Than on the iPhone... Why? Wow, as if we needed more incentive to not invest in the PSPgo, a new trend has arisen during the first day of Mini availability. The same games cost more on the PSP/PSPgo than they do on the iPhone/iPod touch. Unfortunately, the system is setup to charge the consumer at maximum from the get-go. Games from the App Store start at free. PSP Mini games start at $5. The fact of the matter is, the iPhone gaming experience isn't all that great. Full-fledged PSP titles should cost more than tiny downloadable apps any day. But there's no good reason for gamers to pay a premium on PSP titles that are available for less on other platforms, just because they generally pay more for games. There are multiple fingers to be pointed here. Sony, for not allowing free games, which would inspire some price competition. Sony again, for skimming who knows how much off the top of the price point. (In comparison, it's known that Apple takes 30% off of the iPhone App Store sales.) And the publishers, who decide to set their games at prices of up to two or three times the cost of the iPhone version. But the worst part? Not only is the content of overlapping titles generally no better than the iPhone; sometimes it's worse. You see, PSP Minis can't have any network or online features. Nor can they support camera peripherals (a major focus of DSiWare innovation) or DLC. Kotaku just reviewed iPhone port Hero of Sparta. On the PSP it costs triple what you'll pay at the App Store. Their review? "Simplistic controls, muddled graphics and abysmal sounds turn what was a fantastic iPhone game into a oddly disjointed Playstation Portable experience." Kotaku's review of Tetris was much better. But you know what? Tetris costs twice as much on the PSP as it does the iPhone. Some will say, well, you get what you pay for. But that's entirely our point. If you glance across the two platforms, you aren't getting what you're paying for. You're either getting less, or you're getting a lousy port or, best case scenario, you're getting basically the same thing for more. Granted, PSP Minis are very new (they just launched today). The platform is young. And kudos to Sony for making the digital leap. But Sony's most loyal fanbase—those frequenting PSN and checking out Minis on day one—shouldn't subsidize a company's foray into the new digital era. Especially given the relatively high price of the PSPgo, at least compared to other portable devices with a lot more processing power, I think the option for free game downloads—at least for a few approved titles—would be a reasonable thank-you. I mean, even Apple, who doesn't provide the most open platforms in the world, has realized the merit of free app/game distribution. One, they're already making money off the hardware. And two, getting someone visiting iTunes will also get that someone to at least get a glimpse of what else iTunes is selling. Lure them in with a free game and they'll be more likely to purchase one later. Stop pricing these games so high, Sony. Open up your platform, just a crack, make yourselves competitive with the App Store. Because, at the end of the day, we'd all prefer to be playing these iPhone games with full-out controllers. But right now there's quite a lot more iPhones and iPod Touches out there than PSPgos. Don't blow your (only?) shot to win us back.